Two powerful research agencies have published their reports pertaining to Internet usage in India, and there is both good news and bad news: 300 million gadgets which can access Internet will be sold in India during 2015, but sadly only 44% of Indians can afford to buy one as of today. Gartner has released a report based on their findings for Internet enabled devices in India, and the news is certainly encouraging. As per the data, total of 300 million gadgets which include PCs, Tablets, Ultra mobiles and Smartphones would be shipped across India in 2015. Compared to 2014, it is an increase of 4.5%. In this research, they have included a new category called Ultra mobile which includes devices such as Microsoft’s Windows 8 Intel x86 products and Apple’s MacBook Air. For Ultra mobile (Tablets category), devices which have been included are: iPad, iPad Mini, Samsung Galaxy Tab S 10.5, Nexus 7 and Acer Iconia Tab 8, HP Pavilion 11, Lenovo Yoga 2 11 and Dell Inspiron 13. This explosion in the shipment of Internet enabled devices is definitely a good news for the Indian economy, business and consumers, along with telecom players and ISPs. But the question which arises is: How many Indians can afford Internet? Boston Consultancy Group (BCG) has also released a report, which projects a very optimistic future for the Digital industry in India, but alongside, it also states that majority of Indians simply can’t afford to buy such a device. As per the report, the proportion of households which can afford Internet connectivity must have an annual income of $3300 or Rs 2,00,000+. And as per a 2013 report, only 56% of such households exist in India, which means that 44% of Indians can’t even afford Internet. The report states that by 2018, 67% would be able to afford one, as annual income is projected to rise along with the GDP of the nation. The report specifically mentions that handset vendors and manufacturers should ensure that the devices they launch in the market are of low cost if they want rapid adaptation of Internet in rural India. Nearly 65% of all mobiles sold in India are Internet enabled (smartphone) but the least expensive ones are still above $60, which makes it tough for majority of Indians to purchase one. Other challenges which India faces when it comes to expansion of Internet enabled mobiles and Internet connectivity in India are: Network availability and infrastructure, for which Govt. needs to collaborate with Telecom players to make the coverage and speed even better and Awareness. As per the report, 70% of non-users of Internet enabled mobiles phones in India are not even aware of the benefits which Internet can bring into their lives. 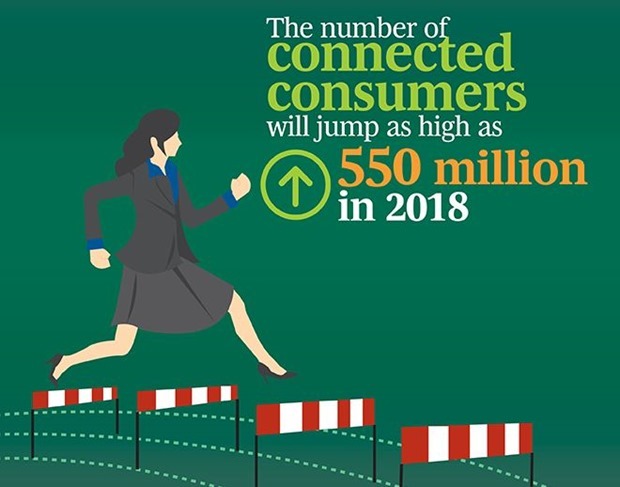 You can access the report: “The Changing Connected Consumer in India” here.